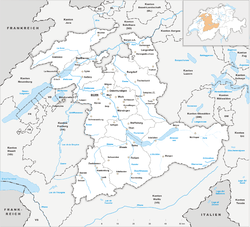 The canton of Bern (German: Kanton Bern, pronunciation ; French: Canton de Berne) is the second largest of the 26 Swiss cantons by both surface area and population. Located in west-central Switzerland, it borders the canton of Jura and the canton of Solothurn to the north. To the west lie the canton of Neuchâtel, the canton of Fribourg and Vaud. To the south lies the canton of Valais. 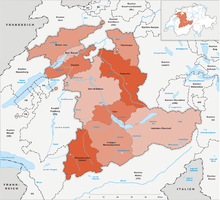 East of the canton of Bern lie the cantons of Uri, Nidwalden, Obwalden, Lucerne and Aargau. 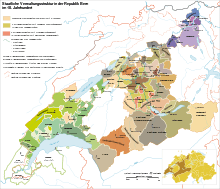 The canton of Bern is bilingual and has a population (as of 31 December 2015) of 1,017,483. As of 2007, the population included 119,930 (or 12.45%) foreigners. 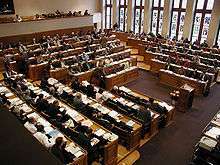 The cantonal capital, also the federal capital of Switzerland, is Bern. Bern joined the Swiss Confederation in 1353 and was between 1803 and 1814 one of the six directorial cantons of the Napoleonic Swiss Confederation. 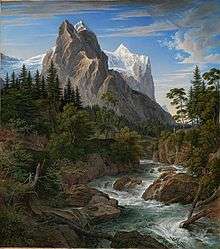 During the early Iron Age (Hallstatt culture from 800–450 BC) changes in climate forced them to abandon settlements along many waterways and in the valley floors and move to the plateaus and hills. With increased trade contacts across the Alps, the cultural influence of the Mediterranean grew in the area. Evidence of this trade include a hydria which was discovered in Grächwil. Burial rituals and social classes became more developed during this time. The so-called princely graves became more common, many of the burial mounds were over 30 m (98 ft) in diameter and 4 m (13 ft) high and richly outfitted with grave goods. In a grave mound in Bützberg the first burial in the mound was followed by several later burials. Often, several grave mounds combined to become a necropolis, such as at Grossaffoltern, Ins, Bannwil, Langenthal and Bützberg. Most of the knowledge about the Hallstatt culture in the Canton comes from graves. The only discovered settlement is around Blanche Church in La Neuveville. The grave good show that iron was forged into swords, daggers, spearheads, knives and wagon accessories. Gold, which was probably collected from river sand, was made into diadems, rings and pendants. Thin bronze arm, leg and neck plates with geometric designs were often buried, especially in the graves at Allenlüften in Mühleberg, at Ins and at Bützberg. The jewelry that was buried included bracelets and rings which were also made of jet and lignite coal. At Münchringen, the grave pottery was both shaped by hand or thrown on a potter's wheel, and was painted with multi-colored ornamentation. The transition to the late Iron Age or La Tène period (450–1st century BC) is indicated by a sudden change of style in the metalworking and ceramic industries. Numerous graves (from unknown settlements) along with the two oppida at Bern-Engehalbinsel and Jensberg by Studen mark the population centers during the late Iron Age. Gold coins (from Melchnau) along with silver and bronze coins first start to appear in this same era. A sword with Greek characters that said Korisios was found at the Port site. At the oppidum at Bern-Engehalbinsel, there were studios for glass and ceramic production and iron working achieved a high level of skill, along with craftsmen who worked in wood, leather and goldsmithing. There was a nearby place of worship in the Bremgarten wood, and cemeteries at Münsingen and Bern-Engehalbinsel. After the Roman victory at Bibracte in 58 BC, the Helvetii were forced to return to their homes as foederati of the Romans. Under increasing Roman influence, the local economy and trade flourished. The main settlements lay on the foot of the Jura Mountains and the Central Plateau. The existing roads were expanded, especially the Aventicum-Vindonissa and the Petinesca-Augusta Raurica roads. A fourth alpine pass, the Rawil was added to the traditional three; the Grimsel, Brünig and Susten passes. In the Bernese Jura the Mont Raimeux and Pierre Pertuis passes opened. Under the Romans, many of the old fortified places were expanded and refortified. The old Helvetii oppidum at the Engehalbinsel became a Roman vicus, which was probably known as Brenodor or Brenodurum. At the foot of the Jens mountain, the fort Petinesca was built to guard the roads over the Jura Mountains. This was reinforced in the late-Roman era (368–369 AD) by a fortified bridge over the Thielle/Zihl river between Aegerten and Brügg. A number of Roman villas were built around the Canton. At Oberwichtrach both the main building (pars urbana) and the industrial section (pars rustica) of a Roman villa have been discovered. The villas at Münsingen, Toffen and Herzogenbuchsee have rich mosaics that are still partly visible. The religious practices of the local population merged with Roman beliefs and the Canton of Bern is home to a number of unique cult centers. They include the larger than life statues of gods (including enthroned Jupiter) at Petinesca, Engehalbinsel and Thun-Allmendingen and a number of inscriptions. 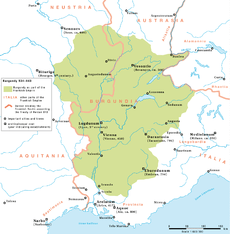 At the beginning of the 5th century AD, Rome withdrew its troops from the Rhine garrisons, but allowed the Burgundians to settle on Helvetii lands in 443 AD. 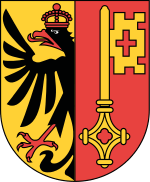 In 1358 the cash-strapped Count Peter II of Aarberg pawned the County of Aarberg to Bern. However, in 1367 he sold it, with out repaying Bern, to his cousin Rudolf IV of Nidau. 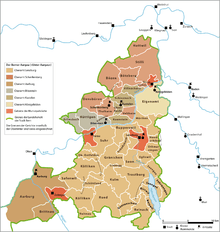 After Rudolf's death (1375) Bern acquired clear right to the Aarberg lands from the other heirs. Throughout the 14th Century, Bern entered into alliances and treaties with many of its neighbors, including members of the Swiss Confederation. Bern entered into a series of agreements with Biel/Bienne, which led to a conflict with Biel's ruler, the Prince-Bishop of Basel in 1367–68. The bishop marched south and destroyed Biel along with a number of towns in the southern Jura Mountains. During the Gugler war in 1375, there were several battles between Bernese troops and English mercenaries under Enguerrand de Coucy. In 1386, the Austrians under Leopold of Habsburg invaded eastern Switzerland. When they besieged the city of Sempach, troops from Zürich, Lucerne and the Forest Cantons marched out and defeated the Austrians at the Battle of Sempach. 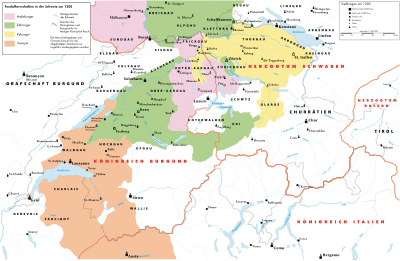 While Bern was not involved at Sempach they used the Austrian weakness to march into the Oberland in 1386, followed by the Seeland (the region south of the Jura Mountains containing the Morat (Murten), Neuchâtel and Bienne (Biel) lakes) in 1388 and the Aargau in 1389. In the peace agreement of 1389 Bern got Unterseen and the Upper Simme valley (Simmental) from the Habsburgs. In the same year, Fribourg accepted Berns acquisition of the Iselgaus, i.e. the area between Lake Biel and the Seeland. Over the next several decades Bern continued to expand to the detriment of the Habsburgs and Fribourg. They acquired the following towns: 1391 Simmenegg, 1399 Signau, 1400 Frutigen, 1407 Wangen, 1408 Trachselwald and Huttwil, 1412 Oltigen and in 1413 (together with Solothurn) Bipp and Bechburg. In 1475, during the Burgundian Wars, the mountain regions of Saanen and Pays-d'Enhaut, who were allied with Bern, attacked and burned the tower of Aigle Castle. They then gave Aigle town and the surrounding district to Bern in exchange for not having to pay one-third of their income to Bern. In the treaty of Fribourg from 1476, Fribourg received rights over the Aigle district, which they gave up to Bern in 1483. Bern rebuilt Aigle Castle in 1489 and made it the seat of the bailiwick of Aigle. Also in 1475, the Confederation attacked and captured Grandson Castle. 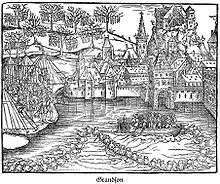 In the next year, Charles the Bold retook the castle and executed the Bernese garrison. In 1476, at the Battle of Grandson, Charles forces retreated and the Bernese retook Grandson. After Charles' defeat at the Battle of Murten, Grandson became a shared territory between Bern and Fribourg. Each city appointed a vogt for five-year periods. 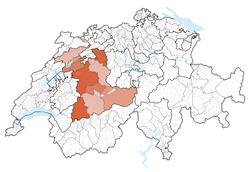 Aigle and Grandson were the first French speaking regions in the Canton of Bern. In the Bernese Oberland during the 13th and the beginning of the 14th century Interlaken Monastery grew to become the largest landholder in the region. 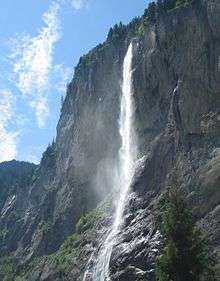 The Monastery controlled the towns of Grindlewald, Lauterbrunnen and numerous farms along Lake Brienz. However, in 1350 a period of crises and conflicts led to a decline in the number of monks and nuns and increasing debt. In 1348, the people of Grindelwald and Wilderswil joined a mutual defense league with Unterwalden. Bern responded with a military expedition to the Bernese Oberland, which ended in defeat for Unterwalden and its allies. By 1472, Bern was the patron of the Monastery. During the Protestant Reformation, the Monastery was secularized in 1528. The canons received a financial settlement and the properties were now managed by a Bernese bailiff. The tenants of the Monastery who had expected the abolition of all owed interest, responded by rioting, which was suppressed by Bern. The lands around the northern shore of Lake Geneva and between Lake Neuchâtel were the next area that Bern expanded into. 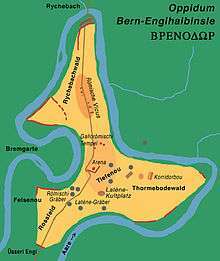 The region had originally been part of the Carolingian Empire. Then, in 1032 the Zähringens of Germany defeated the Burgundians, who were then replaced by the counts of Savoy in 1218. Under the counts of Savoy the area was given political unity, and established as the Barony of Vaud. However, as the power of the Savoys declined at the beginning of the 15th century the land was occupied by troops from Bern. By 1536 the area was completely annexed. Reformation was started by co-workers of John Calvin like Pierre Viret, including a famous debate at the cathedral of Lausanne; but it was only decisively implemented when Bern put its full force behind it. Vaud was another French-speaking region in the mostly German-speaking canton, which caused several uprisings. Both Château-d'Œx and Saanen were part of the county of Gruyère. Both districts had quite a bit of independence and often entered into treaties against the will and best interests of the Counts. In 1340 the Saanen valley concluded a peace treaty with the Simmental, which provided for arbitration in disputes. They entered into another treaty in 1393 with the Valais. In 1401, Count Rudolph of Gruyère entered into a treaty with Bern which included Saanen. Two years later Saanen and Château-d'Œx negotiated their own alliances with Bern. 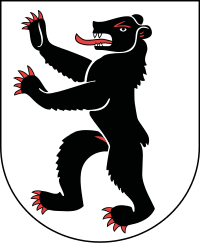 Due to the Bernese alliance, Saanen sent troops, under their own banner, to support the Bernese invasions of Aargau in 1415 and Valais in 1418. The military losses and taxes following the Old Zürich War led Saanen to support the Evil League (Böser Bund) in 1445 against Bern. During the Burgundian War in 1475, Saanen, together with troops from Château-d'Œx and the Simmental captured the Savoy district of Aigle for Bern. Saanen and the surrounding district enjoyed a great deal of independence during the 16th century. However, in 1555 the last Count of Gruyère lost both districts to Bern when his county went bankrupt. 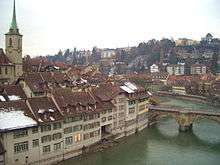 Bern took over the entire Saanen valley in the following year and introduced the Protestant Reformation. 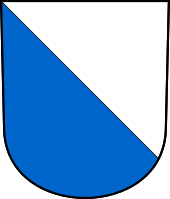 They incorporated the Pays-d'Enhaut with Château-d'Œx into the new Bernese district of Saanen. In the Middle Ages, upwards mobility and access to public offices was relatively easy for successful traders and craftsmen, but Bernese society became ever more stratified and aristocratic as the power and wealth of the city grew. By the 17th century, citizenship had become an inherited prerogative, all political bodies elected one another and officials were elected for life. In effect, public offices were now the exclusive prerogative of the gnädige Herren, the "merciful lords", as the small number of noble families now ruling Bern came to be called. In 1605 there were 152 families that were qualified to rule, by 1691 that number was only 104, while towards the end of the 18th century there were only 69 such families. Meanwhile, the land ruled by the town was extending over more and more territory, so that finally it governed 52 bailiwicks. These offices became very lucrative as the Bernese territories grew. Patrician Landvögte, sheriffs, ruled the politically powerless countryside, often using armed force to put down peasant revolts. 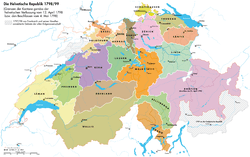 With the Restoration of 1815, Bern acquired the Bernese Jura with Biel/Bienne from the bishopric of Basel, while the canton of Léman became the canton of Vaud and remained separate from Bern. Bern still remained the largest canton of the confederacy from 1815 to 1979, when parts of the Bernese Jura broke away to form the canton of Jura. 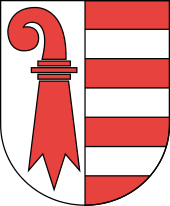 In 1994, the Laufen District was transferred to the canton of Basel-Landschaft. 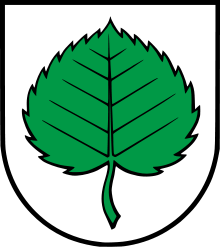 The Bernese Mittelland (Bernese Midlands) is made up of the valley of the rivers Aare, the (Grosse) Emme, some of the foothills of the Bernese Alps, as well as the plain around the capital Bern, and has many small farms and hilly forested regions with small to mid-sized towns scattered throughout. 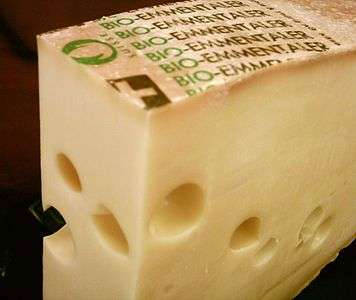 It is perhaps best known by foreigners and visitors for the Emmental. The classic Swiss cheese with holes Emmentaler comes from this region's forests and pastures, of hilly and low mountainous countryside in the 1,000 to 2,000 m (3,300 to 6,600 ft) m range. Bern has a population (as of December 2015) of 1,017,483. As of 2014, 15.0% of the population are resident foreign nationals. Over the last 4 years (2010–2014) the population has changed at a rate of 3.0%. Most of the population (as of 2000) speaks German (804,190 or 84.0%) as their first language, French is the second most common (72,646 or 7.6%) and Italian is the third (18,908 or 2.0%). There are 688 people who speak Romansh. Based on the new methodology of the 2014 census, the percentage of German native speakers increased to 85.1%, French speakers increased to 10.4% as did Italian speakers to 3.1%. The number of Romansh speakers was too small to accurately estimate, but was around 0.1%. The census also reported that 2.9% of the population speaks English as their native language. Respondents could choose up to three native languages, leading to a total above 100%. From the 2000 census, 607,358 or 63.5% belonged to the Swiss Reformed Church, while 153,357 or 16.0% were Roman Catholic. Of the rest of the population, there were 9,153 members of an Orthodox church (or about 0.96% of the population), there were 1,064 individuals (or about 0.11% of the population) who belonged to the Christian Catholic Church, and there were 71,233 individuals (or about 7.44% of the population) who belonged to another Christian church. There were 807 individuals (or about 0.08% of the population) who were Jewish, and 28,377 (or about 2.96% of the population) who were Islamic. There were 2,662 individuals who were Buddhist, 5,991 individuals who were Hindu and 913 individuals who belonged to another church. 74,162 (or about 7.75% of the population) belonged to no church, are agnostic or atheist, and 37,059 individuals (or about 3.87% of the population) did not answer the question. 1 2 3 4 5 6 7 8 9 Canton of Bern in German, French and Italian in the online Historical Dictionary of Switzerland. ↑ Laupen in German, French and Italian in the online Historical Dictionary of Switzerland. 1 2 von Kyburg in German, French and Italian in the online Historical Dictionary of Switzerland. ↑ Böser Bund in Berner Oberland in German, French and Italian in the online Historical Dictionary of Switzerland. 1 2 Bernese Oberland in German, French and Italian in the online Historical Dictionary of Switzerland. 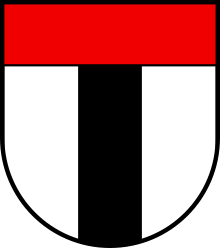 ↑ Aarberg (Herrschaft, Amtsbezirk) in German, French and Italian in the online Historical Dictionary of Switzerland. ↑ Burgdorferkrieg in German, French and Italian in the online Historical Dictionary of Switzerland. ↑ Aigle in German, French and Italian in the online Historical Dictionary of Switzerland. 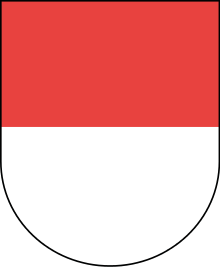 ↑ Grandson district in German, French and Italian in the online Historical Dictionary of Switzerland. ↑ Interlaken Monastery and District in German, French and Italian in the online Historical Dictionary of Switzerland. 1 2 3 Saanen district in German, French and Italian in the online Historical Dictionary of Switzerland. 1 2 Château-d'Oex in German, French and Italian in the online Historical Dictionary of Switzerland. ↑ Coolidge, Rev. William Augustus Brevoort (1911). "Bern". In Chisholm, Hugh. Encyclopædia Britannica. 3 (11th ed.). Cambridge University Press. p. 795. ↑ Canton of Oberland in German, French and Italian in the online Historical Dictionary of Switzerland. ↑ Gerichte und Strafverfolgungsbehörden Archived 1 September 2005 at the Wayback Machine. 1 2 3 4 5 6 7 8 "Regional comparison of selected indicators (Cantons)Kanton". Swiss Federal Statistical Office. Retrieved 8 February 2016. 1 2 Federal Department of Statistics (2004). "Wohnbevölkerung nach Religion" (Interactive Map). Retrieved 15 January 2009.